I am a reviewer for the What's Good To Do website and when we were asked if we wanted to review Aladdin we jumped at the chance. 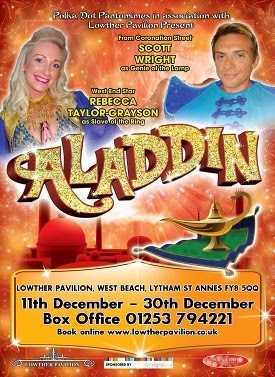 So this afternoon with two excited children in the car we set off down the motorway to The Lowther Pavilion, Lytham, to see Aladdin. Luckily it only takes about 25 minutes to get to Lytham as I’m not sure they could have contained their excitement for much longer! Aladdin is one of my favourite pantomimes as it has a good strong story and it always keeps everyone’s interest. Having plenty of story to work with means that there is no need for the “padding out” scenes that you sometimes get in pantomimes. This production had all the usual elements that you expect in a pantomime with plenty of “goodies” and the usual “baddie”. Add in plenty of bad jokes, the usual local references and a good dollop of audience participation and we’re all set for a great show. As William wasn't that bothered about going we took our 4 year old niece with us as she had never seen a pantomime before. She had a great time and was clapping and joining in with everything. At one point there was a chase scene and the action moved off the stage and into the seating area, Luke and Daisy thought this was really funny especially when we all got showered with water from the water pistol! The action moves from place to place with a great number of set changes. Some productions try to cope with a smaller number of sets but this was not the case here. There is a scene where Aladdin and Jasmine take to the air on a magic carpet which uses projection to give the illusion of flight this worked very well and had Daisy spellbound. All the characters were well cast and included Scott Wright from Coronation Street. As you would expect from a panto there was plenty of humour, lots of silliness from Wishee Washee for the younger children and plenty of harmless jokes for the adults that went straight over the children’s heads. At the end of the day the real judges of how good a pantomime is are the children and judging by the faces of both our children and the children around us this pantomime was a definite hit. The pantomime is on until the 30th December and costs £13 for adults, £11 for children and £12 for concessions and is well worth a visit. Disclaimer - We receieved free tickets for the purpose of this review but all words and opinions are our own.